"We give you a shitload of Atoms just for playing the game." 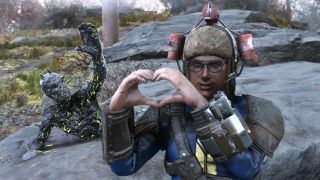 We've known for a while that Fallout 76's microtransactions will focus on cosmetics and not any pay-to-win nonsense, and Bethesda's Pete Hines has discussed how the game's Atoms currency pays out in Fallout 76 in more detail. "If you don't want to spend money in the Atomic shop for cosmetic stuff you don't have to. We give you a shitload of Atoms just for playing the game," Hines told Gamespot at PAX Australia. "Folks that want to spend money on whatever the hell it is because they don't have enough Atoms, they can, but it's not, 'I'm now better playing against other players because I spent money.' It's not pay-to-win. And it's not loot crates." Hines then underlined once again that all of Fallout 76's post-launch DLC will be free. After playing the beta for a few hours, I did feel like I was earning Atoms at a steady clip for completing certain challenges, like killing enemies or crafting certain items. I'm not personally desperate for cosmetics (or photomode emotes, as shown above) in a game I will only ever play in first-person, but maybe when I'm playing with others I'll change my mind. Gamestop in Ireland has retail listings for Atoms on console (cheers GamesRadar) that put the price at €10 for 1000, with various 'bonus' Atom amounts depending on how many you buy at once. These could just be placeholder listings, though. I left my computer on for most of yesterday to download the Fallout 76 beta because of my bad internet—then I clicked a button last night and the download started again. I briefly thought I'd imagined downloading it to begin with, then I looked on the internet and saw it was an error. Oh well. The real victim here? My electric bill. On the plus side, Fallout 76 will get another extended beta later this week to make up for it.